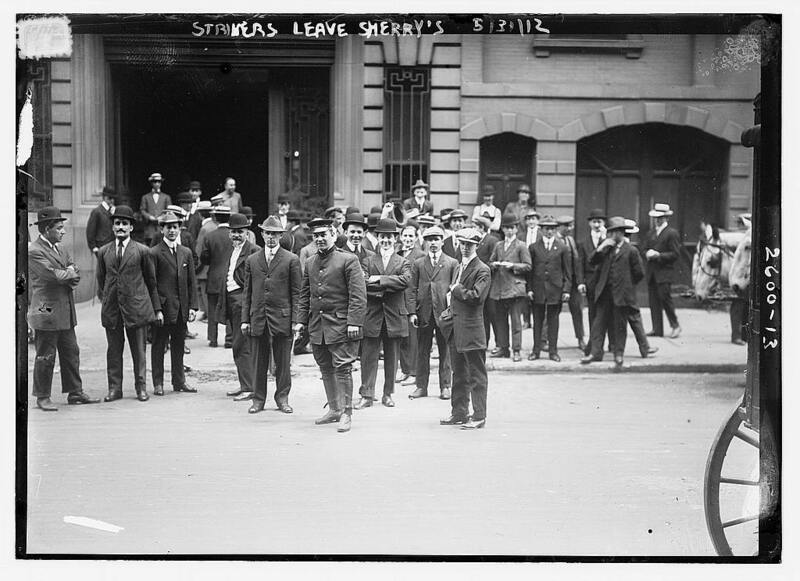 One hundred years ago today, a rather peculiar worker’s strike ended, a protest which had paralyzed New York’s restaurant and hotel industries for almost two months. The strike had begun in early May, and by the month’s end, thousands of employees had walked off their jobs, leaving diners in emptied restaurants and wealthy hotel guests to carry their own luggage. What made this particular walkout unusual weren’t the demands — improved conditions and pay, recognition of their newly formed union — but the locations where the strikes occurred. The employees of the very toniest and best known restaurants and hotels left their jobs in unison. Establishment affected included the Plaza, the Hotel Astor, Hotel Knickerbocker, the Waldorf-Astoria, the St. Regis, the Vanderbilt, and restaurants like Delmonico’s and Sherry’s (pictured above), among dozens of others. And even their timing was lousy. Drama at the Democratic presidential convention in Baltimore knocked the strike almost completely out of the headlines that week.